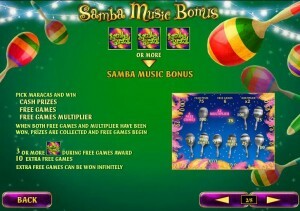 Samba Brazil is the kind of game that you can try if you want to see what the Rio Carnival is all about. With beautiful Samba dancers, with feathers, musical instruments and fire breathers among the symbols, it’s a game unlike most. It’s also a Playtech title, one of the better ones they’ve created and quite a bit of fun if you give it a chance. 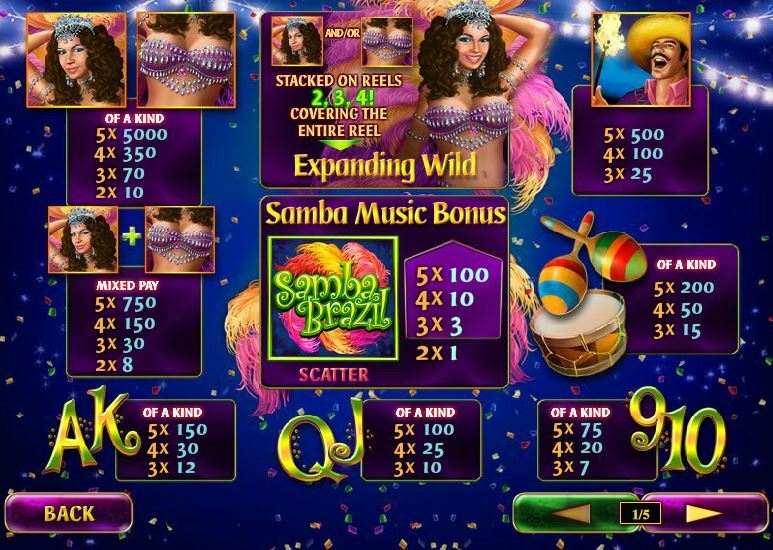 Samba Brazill will put 5 reels & 25 bet lines in front of you, with symbols and features including stacked wilds, scatters, bonus games, free spins and multipliers. You can also expect up to $250,000 in prizes. While the game doesn’t really bring anything new in this area, it does have some unusual features. The two expanding wilds are part of that. The rest are scatters which can trigger bonus games and offer cash prizes. The stacked wilds are present on three reels (2, 3 and 4), while the other two get only regular wilds. 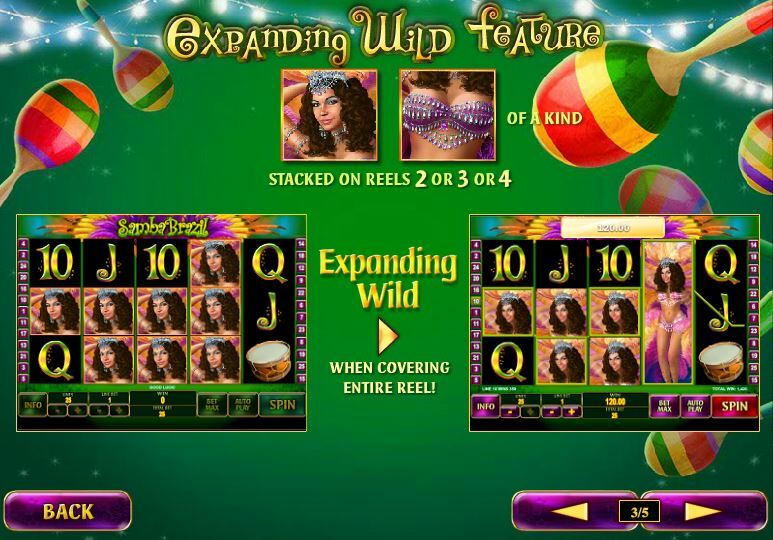 There are two wilds here, but they can work together and even offer mixed pay prizes by forming combinations. One wild shows you the face of the Samba dancer, the other one shows you her cleavage. If the stacked wild covers the entire reel, then it becomes an expanding wild with a single long image instead of three smaller ones. It seems to be mostly a visual thing, nothing extra is gained by this transformation. Wilds are capable of forming combinations and offering up to 5,000x for five matching symbols. When they form combos with two types of wilds, the pays go up to 750x. 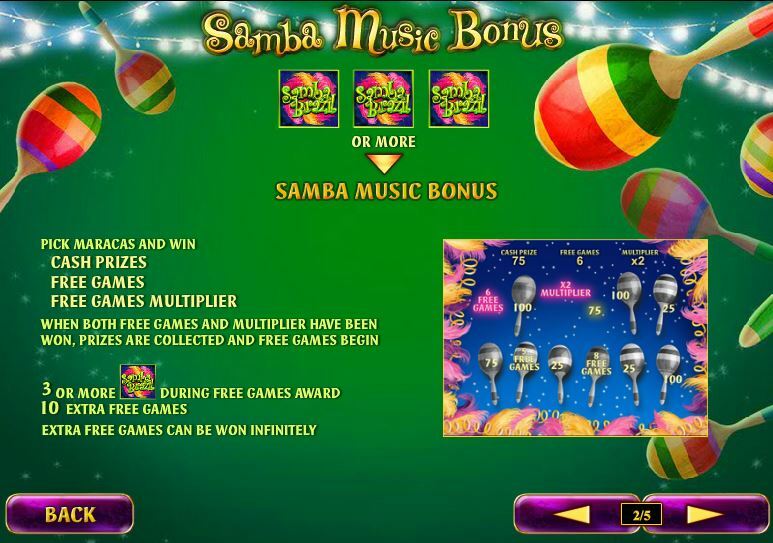 Like most scatter symbols do, the one available in Samba Brazil also offers prizes when at least two of them are randomly placed on the reels. The prizes start at just 1x the bet, but they can get as high as 100x when enough Game Logo scatters are present. The bonus game starts with 3+ Game Logos. The next screen displays various maracas, from which you have to choose. 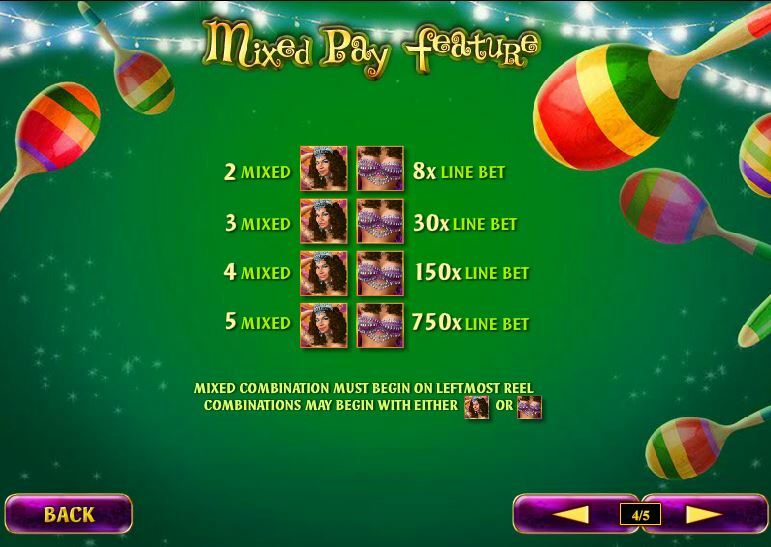 You can win cash prizes, free spins and multipliers for the latter. You can retrigger the free spins as well, with another 10 rounds offered when 3 Game Logos appear. An interesting thing about the two wilds is that they can form combinations by mixing Face and Cleavage symbols. Two to five symbols which have both icons among them will pay between 8x and 750x the line bet. The game doesn’t try to make things too complicated, relying mostly on a combo of lines and line bet decisions. You can choose 1 to 25 lines to be active each round, after which you pick a line bet of $0.01 to $50. It can be as cheap as $0.01 per spin, or it can cost you $1,250. Five matching wilds, on the same line, will reward you with 5,000 coins, so up to $250,000 cash if you made a big enough wager. It’s a cheerful design, with the symbols being all music related or showing off Brazilians that are having a lot of fun. There are some things about it that I’m not a big fan of, like the simple black background used on the reels, or the playing cards which all use the same style. Symbols: Dancer’s Face (5,000 coins, wild), Dancer’s Cleavage (5,000 coins, wild), Samba Brazil Logo (100x bet, scatter), Mixed Pay Symbols (750 coins), Fire Breather (500 coins), Maraca (200 coins), Drum (200 coins), Ace (150 coins), King (150 coins), Queen (100 coins), Jack (100 coins), 10 (75 coins) & 9 (75 coins). There are plenty of things to love about this slot, from its cheerful attitude, to the value of the biggest prizes or the stacked wilds and bonus features. 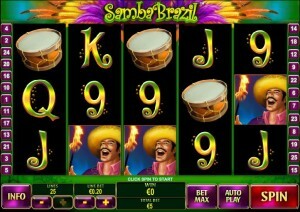 Samba Brazil can be found at any Playtech casino, where you get a chance to play it for real money or in free mode.